Skoda Yeti is an elegant car which has very unique elements. The radiator grille of this car is butterfly shaped. It is equipped with sophisticated items like the touchscreen infotainment. The interior materials of this car are made up of good quality plastic. There are multi-functional switches installed at different levels in the car. The car offers electronic stability, park distance control, airbags, etc. There are 2 variants of this car with 1 engine, 1 transmission and 1 fuel option. 1. Skoda Yeti Elegance 4 X 2 – Diesel variant with 17.72 kmpl mileage, manual transmission and ex-showroom price around INR 20,10,000. 2. 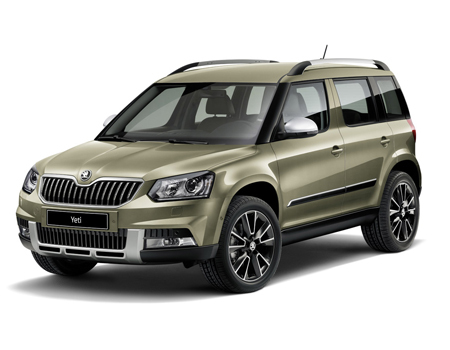 Skoda Yeti Elegance 4 X 4 – Diesel variant with 17.67 kmpl mileage, manual transmission and ex-showroom price around INR 21,80,000.